In commemoration of the International Day for Overcoming Extreme Poverty, the Department of Social Welfare and Development (DSWD) -7 through its Pantawid Pamilyang Pilipino Program conducted a Media Forum with the theme “Pagpapakilala at Pagkilala sa Natatanging Benepisyaryo ng Pantawid Pamilya!” wherein selected beneficiaries whose lives were improved through the support from the human development programs of the national government were in the spotlight. 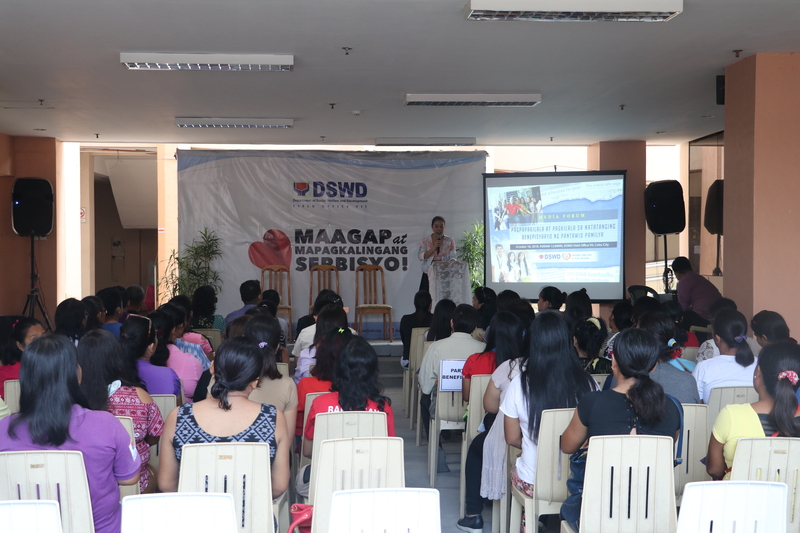 Pantawid partner-beneficiaries, representative from partner National Government Agency (NGA), DSWD officials and media practitioners participate in the forum conducted in commemoration of the International Day for Overcoming Extreme Poverty. The DSWD being the lead agency in social welfare and development, the forum also highlighted the contribution and effort of the department in overcoming extreme poverty nationwide through its Pantawid Pamilyang Pilipino Program (4Ps) and other programs and services for the poor, vulnerable and disadvantaged. Regional Director Ma. Evelyn B. Macapobre emphasized in her message to the participants that it is necessary for the beneficiaries to know their role in improving their status in life and in overcoming extreme poverty. “We, in DSWD are only supporting actors and actresses. While the department is all-out in providing support to you, your efforts are important to win this battle against poverty,” Director Macapobre told the beneficiaries. During the forum, a comprehensive update on the accomplishments and gains of the Pantawid Pamilyang Pilipino Program in the region was also presented by the Regional Program Coordinator, Ms. Raquel N. Enriquez. Ms. Enriquez highlighted the Pantawid compliance rate of the region. For Health, the region got 99.12% as of July 2018 while 96.75% for Education as of school year 2017-2018. Moreover, she also mentioned that 1,717 from the 2,180 monitored and enrolled Expanded Students Grant-in-Aid Program for Poverty Alleviation (ESGP-PA) grantees have already graduated as of S.Y 2017-2018 where 204 graduated with honors from different state universities and colleges. Johanna Heart Genon, of Brgy. Kalunasan, Cebu City whose family was a former homeless street family and now a beneficiary of the Modified Conditional Cash Transfer (MCCT) Program which helped them secure a permanent house also guested in the forum together with Joel Vincent Oyao, a grantee of the Expanded Students Grant-in-Aid Program for Poverty Alleviation (ESGP-PA) who just graduated this March 2018 with the degree of Bachelor of Science in Education Major in Special Education. 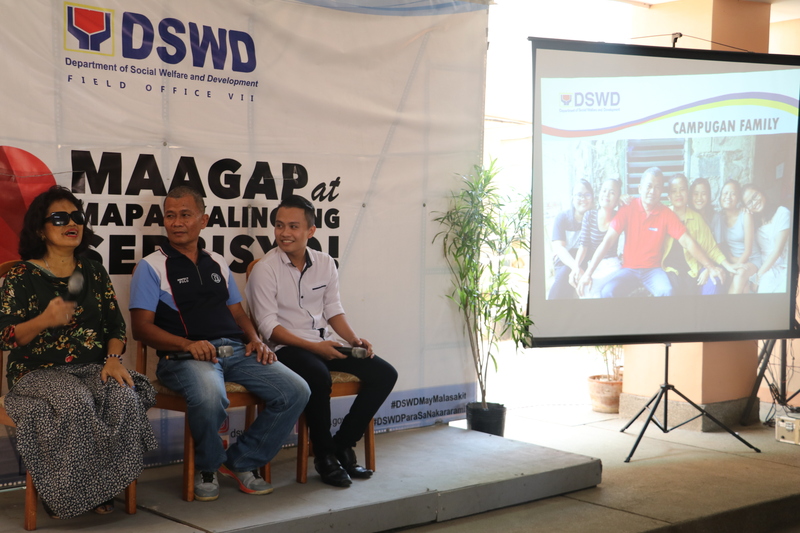 The three members of Campugan Family in Poblacion, Cordova Cebu who was hailed as the Regional Winner for Huwarang Pantawid Pamilya gives testimony on how their lives were changed through their sheer determination and support from the government’s Pantawid Pamilyang Pilipino Program . Among the guests was also the Campugan Family of Brgy. Poblacion Cordova, Cebu who was hailed as the 2018 Regional Winner for the Regional Search for Huwarang Pantawid Pamilya and who placed as 2nd runner up during the National Search held in SM North EDSA Skydome, Quezon, City last October 14. The Campugan family has given their testimonials on how their lives have improved and how the the children in their family have successfully finished their studies through their sheer determination and support coming from the government. They also proudly showcased their talent as they in dancing, declamation and spoken poetry. A press conference with the guest partner-beneficiaries, DSWD-7 officials and a representative from the National Economic Development Authority (NEDA) followed thereafter.